Dimensions (HxWxD): 3.25" x 1.25" x 1.2"
This unpolished 3.25 inch long Smoky Citrine Lemurian Wand, weighing 84 grams, comes from a new find in the Serra do Cobral Mountain range in Brazil, where both the old and new Lemurian mines are located. 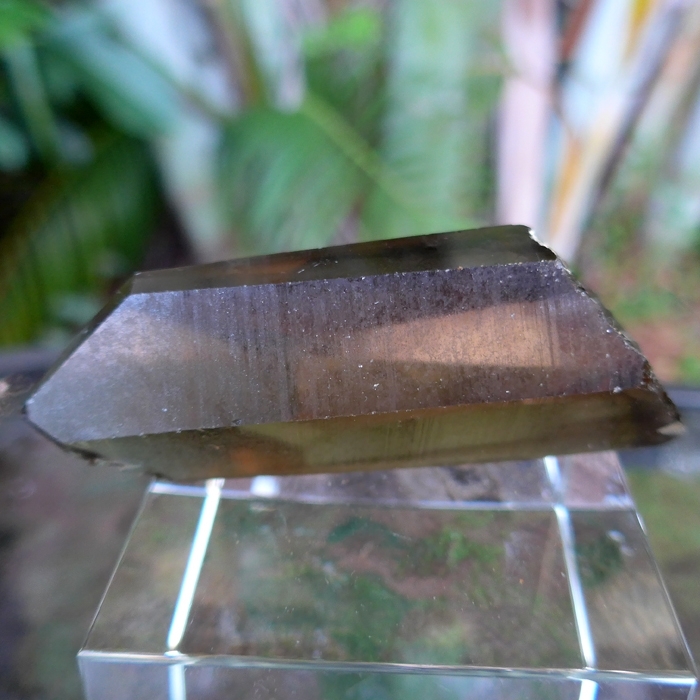 Now, for the first time, Lemurians are being found which are composed of smoky citrine. This basically water clear Lemurian wand exhibits the striations on the shaft characteristic of all Lemurians, and has a few dings on the termination tip, which often happens as a result of the way these crystals are mined, using high pressure water jets to force them out of the sides of a small mining pit. As they fall to the bottom of the pit, they can get dinged! Smoky quartz is a traditional stone of slow transformation and purification of the emotional body through deep meditation, and citrine is the golden purifier, actively transforming and elevating the sluggish – or stuck -- energies in an individual’s energy system. 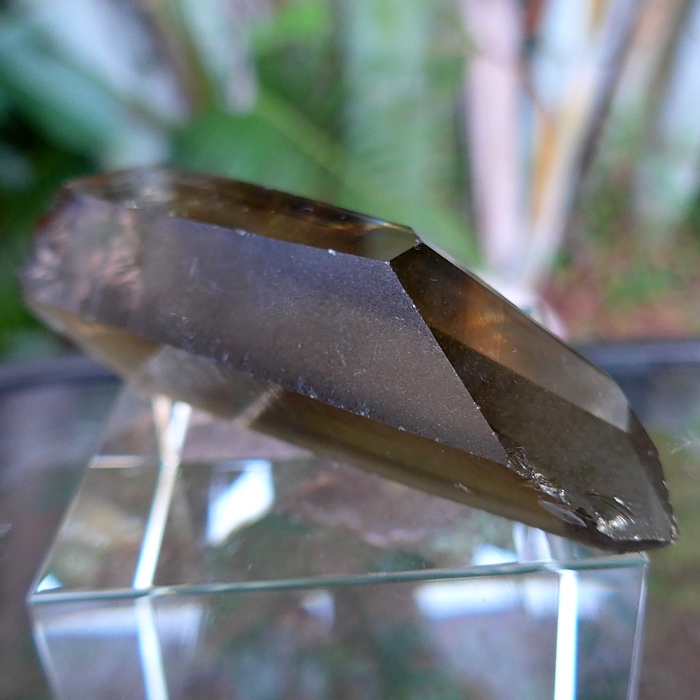 Smoky quartz and citrine are both found in high-temperature hydrothermal veins in Brazil, and both are used by Lightworkers to transform negative or unwanted energies. Smoky Citrine combines the energies of these two powerful types of crystal. Smoky citrine works to gently purify and cleanse the physical and astral bodies, energize the root, third and crown chakras, increase the flow of Universal Life Force energy throughout the mind, body and aura, and to protect the bearer from unwanted or deleterious energies impacting the bearer's energy field. Read more about the mineralogical and metaphysical properties of Lemurian crystals of various types in our new online book Spirits of Stone. Read Chapter Two & learn about the history & use of Lemurian Seed Crystals. See new photos from the Lemurian mines of the Serra do Cabral and a map of the mines. You'll find links to this new book, in the left hand column of this page. Just scroll down and click to enjoy! Lemurians are said to have been left behind by an advanced ancient civilization known as the Lemurians. Lemuria is said to have been an intuitive, spiritual civilization. Thus all subsequent human civilizations owe a huge debt of gratitude to the Lemurian priestesses, who created the first Mystery Schools teaching enlightenment through direct experience of nature, the firsthuman system of ethics, the first art and highly developed system of aesthetics and the first, prototypical human language. 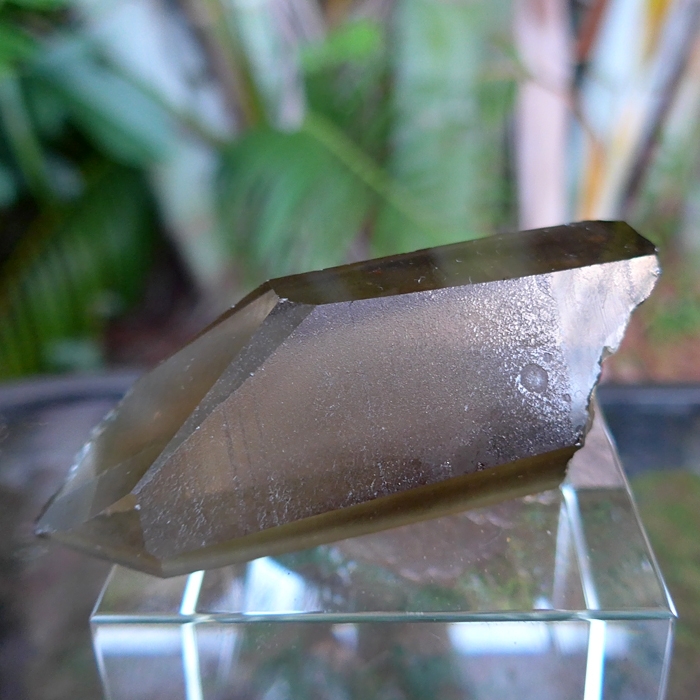 Jane and I have used these Smoky Citrine Lemurian crystals in meditation and in our Reiki practice, and we are amazed by their complex and powerful energy. During meditation and in Reiki sessions, we found that they impart a deep, nurturing warmth, most noticeable first in the “hara” center, the storehouse ofUniversal Life Force Energy, or “chi”, located two fingers width below the belly button. This warm glow expanded throughout our bodies, then extended out into the aura, enlivening and brightening body, heart, and spirit. We also found Smoky Citrine Lemurians to be very helpful companions during sleep cycles, triggering profound dream experiences, helping us recall meaningful dream experiences, and gently triggering needed catharsis of negative emotional baggage. Reiki clients report that Smoky Citrine Lemurians provide a warm, nurturing, yet energizing effect on the body and mind, noticeable for periods of time up to several days after treatment. Citrine is an excellent stone for clearing and cleansing body, mind, heart and aura. Citrine is considered by metaphysical rock hounds to be a stone of strong protection because of its ability to cleanse the aura. Above weight is shipping weight. Net weight is 84 grams.